The University of Winnipeg offers numerous land-based Spring and Summer Institutes, often in partnership with Indigenous communities and Elders. These intensive courses allow students to earn credits while engaged in hands-on learning opportunities. Check back here for the 2018 institutes that will be offered. Students participated and learned about the 50 medicinal, nutritional and cultural uses of plants from Indigenous perspectives and knowledges in and around Keeseekoowenin from Elders. Students visited the Fisher River Cree Nation and learned about Indigenous food systems, challenges and opportunities. 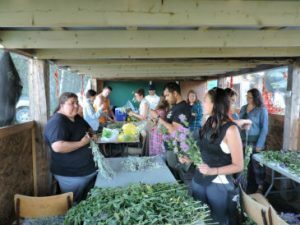 Students learn from Elders and band council members, for example: goose plucking, cleaning and preparing a goose and traditional food teachings from elders and community members. They also participated in open fire cooking, community gardening and basic fishing and other land-based learning activities.